David Brown Automotive is showcasing the ‘Best of British’ with images of three of their latest production-specification Speedback GTs in patriotic red, white and blue exterior paint finishes. Since the initial reveal of Speedback GT, 237 engineering and design improvements have taken place to ensure that every production Speedback GT is no less than perfect. The latest images show production-specification cars numbered 003, 004 and 005, in colours that resemble those of the Union Flag and which celebrate our growth and continued development as a proud, British automotive manufacturer. Using a combination of engineering, state-of-the-art technology and traditional coachbuilding manufacturing techniques to build each car, Speedback GT comprises 142 handcrafted panels and highly sophisticated systems and electronics. Through these specialist, low-volume manufacturing processes, they are redefining modern coachbuilding to build fully engineered limited-edition, bespoke automobiles made from hand-formed aluminium with entirely handcrafted interiors, each specially commissioned by the customer. 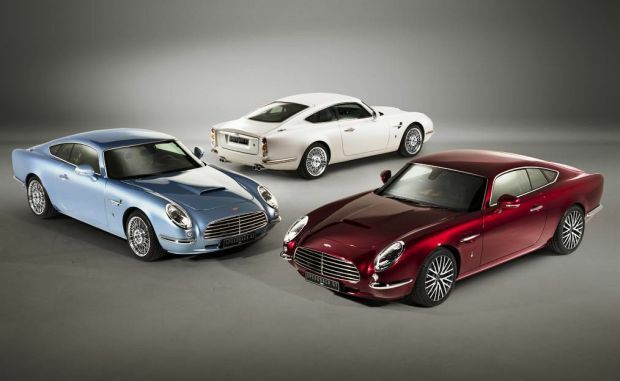 Each and every Speedback GT has a completely unique colour, which is developed by the company for each owner and specially created for each individual car. The cars pictured, painted in Ruby Tuesday, Blue Moon and White Knight, are painstakingly prepared, painted and lacquered over a period of eight weeks each, finished to achieve a rich, deep and flawless finish.